“Tiger’s Nest?” I was little surprised. “Yes, Tiger’s Nest!” Kinley smiled. Kinley was the guide of our week long Bhutan tour. We had learnt that this Himalayan country has a very special parameter to measure its progress – Happiness Index. It sounded peculiar to us initially but we realized it as soon as we landed in Bhutan. Bhutanese people are extremely law abiding, polite and charming. There is a sense of satisfaction reflected on their faces, and that’s why Happiness Index has been rightly chosen as their mark of progress. The city, Paro has the only International airport in Bhutan ( also called Kingdom of Bhutan) and is 55 Kms from the capital Thimpu. Tiger’s nest is situated 10 Kms north of Paro, on the side of the cliff of upper Paro valley at a height of 3120 mts. The white walls of the building with golden roofs, clinging on the top of dark grey mountain amidst emerald green Paro valley gives a breathtaking view. The cave where Guru Padmasambhava had landed riding a tigress is known as “Tholu Phuk” and where he had meditated for 3 years, 3 months, 3 weeks, 3 days and 3 hours is called “Pel Phuk”. Thereafter, many other Buddhist monks visited this place and spent time in solitude. It was the idea of the famous Tibetan Buddhist Lama Ngawang Namgyal to create a monastery in honour of Guru Padmasambhava. However, the actual work started in 1692 under the supervision of Gyalse Tenzin Rabgye (1638-1696) – the secular ruler of Bhutan. Though seems formidable, Tiger’s nest can be accessed from several directions. The northwest path is through the forest. The second path is from the north over the rocky plateau called ‘Hundred Thousand Fairies’. The third approach path which is normally taken by the devotees is from the south. The 2.5 hrs climb along this path will take you to ‘View point’. From there, Tiger’s nest can be seen majestically situated on the opposite ravine, covered by clouds. There is a cafeteria at ‘View point’ and horse rides are available till this point. Beyond this, the climb is very steep to the top, then a deep descend into the gorge and finally 700 steps climb to the next hill will take you to your destination. The scenic trek is through the pine trees and fluttering prayer flags are found all along adding to the natural beauty. The monastery has 4 temples and several dwellings for the monks. You will find the main “Dharma Chakra” or the ‘Prayer Wheel’ placed in the courtyard. It is rotated daily at 4am by the monks to mark the beginning of a new day. Rotation of Dharma Chakra symbolizes the continuous dissemination of ‘Message of Love and Compassion’ of Lord Buddha in all directions. You will come across Dhrama Chakras of varying sizes in Bhutan. Some are run continuously by water turbines! All the temples are interconnected by staircases carved out of stone and almost all the dwellings have balconies to give you a panoramic view of the lush green Paro valley. As you enter the temples, your eyes will be dazzled by several lamps illuminating the golden idols. Bright Thangkas ( Cloth paintings ) and wall paintings beautifully depict the legend of the place, various gods and goddesses, demi gods and religious symbols. Himalayan tribes are also seen in the paintings. 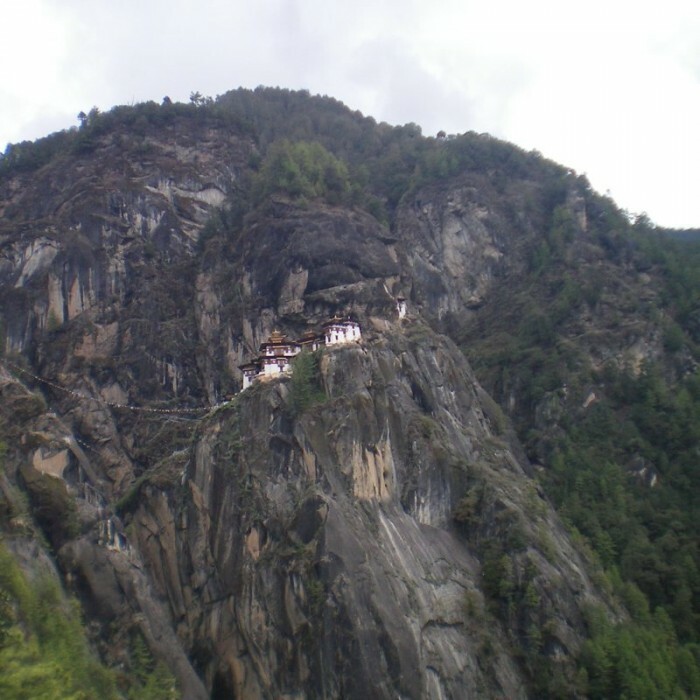 From the foot hill or from the Paro valley, Taktsang Monastery seems to be inaccessible and an ideal place for monks who desire to spend their lives in solitude. However, its inaccessibility made Bhutan pay very dearly when Taktsang Monastery was caught in a devastating fire in April 1998 and the authorities could not send any help from the plains. The entire monastery was gutted. After 7 years of painstaking effort of highly skilled craftsmen and at a cost of more than 2 mn USD, Taktsang Monastery was finally restored to its original glory in 2005. Tiger’s Nest is a cultural icon in Bhutan and the best time to visit it is between April and May when the festival Tsechu is celebrated in the honor of Guru Padmasambhava. For this trek you would need a small daypack, a pair of hiking boots (men, women), trekking poles – since the climb after ‘Viewpoint’ is quite steep, a pair of binoculars, a camera, a tripod, a monopod to make selfies, enough water, altitude sickness pills and of course a rain coat, since in Bhutan, a sunny day can turn into a rainy day in no time. At this altitude, in a clear sky the sun is very bright, so carry some sunscreen for face too. Have a little stock of some protein and energy bars before you start, as they’ll keep you going. Start early when it is cool, climb slowly and return to the cafeteria for lunch. Bhutan is famous for its remoteness, pristine natural beauty and rich cultural heritage. Of late, it has opened its gates to foreign tourists. Many operators conduct adventure tours, cultural tours, religious tours or treks in Bhutan. Undoubtedly, a trek to Tiger’s nest will give you an incomparable experience and leave an undeniable mark in your memory for many years to come.